The filters in your Audi or Porsche vehicle prevent contaminates, whether airborne or liquid-based, from infiltrating its various systems. 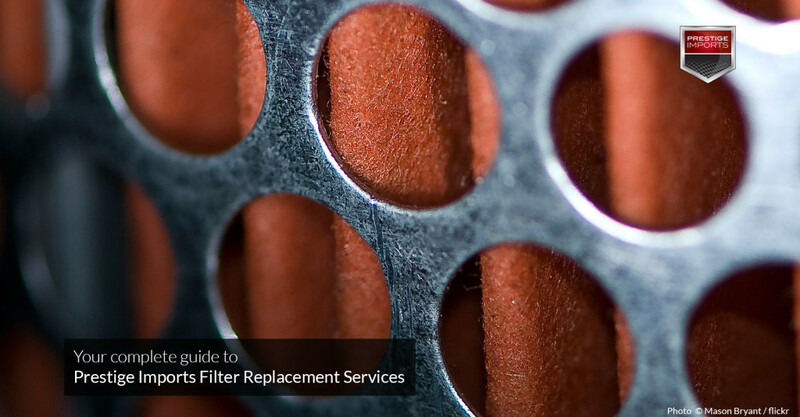 In doing so, these filters help to maintain the efficiency, performance, and long-term health of your vehicle. Most modern vehicles contain engine, cabin, fuel, transmission, and oil filters. A clogged or dirty engine air filter results in decreased engine performance, increased wear on engine components, as well as poor throttle response. If you replace your engine air filter regularly, your vehicle will accelerate at peak levels, and its oxygen sensors will function correctly. The Audi and Porsche certified technicians at Prestige Imports can visually inspect your engine air filter to determine whether or not it needs to be changed and install a new one if necessary. While manufacturers design most filters to protect the internal mechanisms in your vehicle, the cabin air filter protects you and your passengers by collecting dust, allergens, pollen, smoke, smog, dander, mildew, fungus, and mold and preventing it from entering your car. Your Audi or Porsche certified technician can inspect you filter to determine if it needs to replaced in the event that you cannot remember the last time it was replaced. A clogged or dirty fuel filter will inhibit the flow of fuel into your engine, which can damage your vehicle or cause it to stop running. Likewise, even a relatively small amount of dirt can block your filter and, thus, your fuel injector. Partial blockages will result in poor gas mileage and substandard performance. The Audi and Porsche certified technicians at Prestige Imports can determine whether or not your fuel filter needs to be change and do so, if necessary. When contaminants partially or fully block your transmission filter, transmission fluid will cease to flow properly. Many modern vehicles, such as those manufactured by Audi and Porsche, use transmission filters and transmission fluid that are designed to last the lifetime of the vehicle. The only time the transmission filter or fluid should be changed is if there is a problem with the transmission and a major repair is undertaken. The engine oil filter is replaced as part of our Porsche and Audi Oil Change Service packages. Call (833) 825-5423 to schedule an appointment for a Porsche or Audi Filter Replacement Service with a certified technician in the Parts and Service Department at Prestige Imports.